In 2014, it was hepatitis C drugs while 2015 brought us PCSK9 inhibitors. Could 2018 be the “blockbuster” year of calcitonin gene-related peptide (CGRP) inhibitors for migraines? As was the case with those previous therapies, CGRP drug uptake will depend on a plan sponsor’s population and how efficiently the class is managed by the plan’s preferred vendors. Before diving into the emerging migraine agents and potential strategies to contain them, a high-level overview of the world’s third most prevalent illness may be beneficial, especially for American employers who lose over $13 billion annually due to an estimated 113 million lost workdays by employees with migraines . Migraine headaches impact about 18 percent of women and 6 percent of men in the United States, with a peak prevalence occurring between the prime working ages of 25 and 55 . The 39 million sufferers of migraines, known as migraineurs, can experience incapacitating pain during an attack that lasts anywhere from four to 72 hours along with nausea, vomiting or sensitivity to light or sound. Other neurological symptoms, such as auras, fatigue and/or the inability to concentrate, often occur before and after migraine headache attacks, which is why migraines are classified based on the number of headache days per month . About 90 percent of migraineurs experience 14 or less migraine headache days per month, which is the threshold for episodic migraine (EM). Chronic migraine (CM) is characterized by having 15 or more headache days per month for at least three months . Even with the distinction in days, over half of migraineurs are never diagnosed and those who seek care are often not effectively treated . The current treatment landscape can lead to depression, anxiety and sleep disturbances as patients cycle through nondrug therapies (e.g. diet and exercise, relaxation techniques, cognitive behavioral therapy) and medication treatments that are frequently discontinued due to lack of efficacy or tolerability . At a high level, migraine products can be broken out as acute treatment for use when symptoms arise or preventive treatment to reduce the severity and/or frequency of attacks. Triptans are the standard of care for acute instances, but they are the only current drug class that has been specifically developed for migraines. Other acute treatment options that are typically prescribed are nonsteroidal anti-inflammatory drugs (NSAIDs), corticosteroids, opioids and anti-nausea medications. Preventive drug therapies that have shown effectiveness include drugs in classes used to treat depression, seizures and blood pressure . CM patients have the added treatment option of receiving Botox® injections for prevention, and like the other preventive therapies, generally require at least three to four months of use to determine efficacy. Discovered in 1983, CGRP plays an important role in pain signaling as well as dilating blood vessels in the brain and peripheral vasculature. During a migraine attack, CGRP levels rise and clinical trials for the drugs that inhibit its effects have shown some efficacy in treatment and prevention. While slightly effective in acute treatment, the quest to bring an oral CGRP product to market has met its challenges due to the adverse liver reactions associated with metabolism for some of the early attempts. 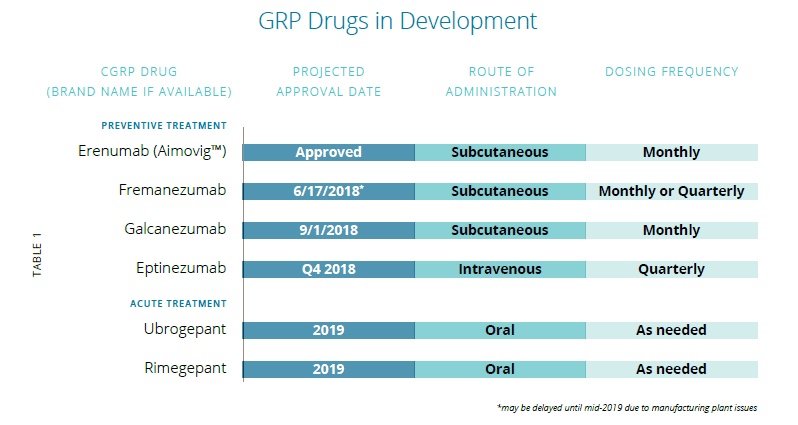 After these setbacks, manufacturers focused in on the potential to develop CGRP products as self-injectable monoclonal antibodies (mAbs) for migraine prevention since their metabolism has not shown to produce toxic metabolites . Patients in trials taking the CGRP mAbs saw an average decrease in the number of headache days by three to four per month, but this was only better than placebo by a day or two. That minimal gap in days was observed in trials for both EM and CM patients. However, the real excitement is for the roughly 15 to 20 percent of “superresponder” patients in trials who have experienced zero headache days taking CGRP mAbs whereas no placebo patient achieved that much relief. Yet, the exact functions of CGRP still remains somewhat limited, especially when it comes to the long-term safety for drugs targeting the protein. Since migraineurs have higher cardiovascular risks, blocking the presumed protective effects of CGRP in the vasculature is a significant concern that may limit initial use. The good news is that short-term safety data does not show negative cardiovascular effects for the upcoming mAbs. In fact, all four CGRP mAbs that may be approved in 2018 (Table 1) appear to be well tolerated by patients . The primary focus for payers will be to ensure that only those who respond to therapy will be able to receive the medications based on the evidence seen in trials and anticipated annual wholesale costs of $7,000 to $10,000 per patient. As with most drugs, the most effective way to manage CGRP drugs will be through the use of utilization tools, such as prior authorization and step therapy. Before digging into what that criteria may look like, it is important to not forget about the triptan drug class (e.g. sumatriptan), which are the acute medications used during a migraine attack. All plan sponsors should have quantity limits in place on these products because overuse of triptans can exacerbate further headaches. If multiple CGRP products are approved as expected, PBMs should have extra leverage to negotiate rebates with manufacturers to lower the overall net price of the drugs. Thus, plan sponsors with exclusion formularies and sound contract language should be able to benefit from the increased competition. For those products that make it on the formulary, ensuring the patient is averaging at least four migraine days per month will be an essential part of prior authorization criteria. Another potential aspect could be necessary steps through cheaper generic alternatives, such as topiramate, which has similar effectiveness to the CGRP drugs for prevention but not as favorable of a side effect profile . Perhaps the most important requirement will be recurring evaluation of effectiveness after six months, so those “super responders” can continue to receive the drug while those who do not experience at least a 50 percent reduction in migraine days would lose coverage. Pharmacies that utilize health care professionals for patient outreach should be able to assist in evaluating effectiveness as well as boosting adherence to the self-injectables. Finally, employers may see benefits in absenteeism and presenteeism by providing migraine educational programs to their employees who may not seek care otherwise or understand the various nondrug techniques for migraine reduction. While the thought of every migraineur taking expensive drugs may cause budgetary headaches, the potential savings from CGRP inhibitors may be seen if the drugs are taken by the right plan participants. The key will be to partner with vendors to ensure that takes place more often than not. To discuss further, please contact Matt Harman at mharman@employershealthco.com.